Since the 2008 worldwide financial crash, regulations and risk management have pushed themselves to the fore of all business. This has affected the shipping and commodity business in many ways; From trading FFAs via Clearing Exchanges, to counterparty risk being treated as importantly as the vessel itself. And, it has also filtered into the world of laytime. Laytime is one of the few contractual elements that sits in both worlds of commodity and freight. As such, laytime becomes a part of the commodity sales contract, eg: SCOTA Coal FOB + DES contracts, GAFTA Grain contracts, North Sea Oil FOB contracts, as well as the freight contracts. In the old days, the impression was that many charterers would wait for owners to submit laytime calculations at the end of a voyage, and then negotiate as slowly as possible with the owner. This helped cash flow as well as provided laytime experts with the potential to protract negotiations and even try to make a profit from laytime. However, times are changing. Not only have commodity contracts and freight contracts timebars stipulated within them to speed up the settlement of laytime, but charterers appear to have recognised that many laytime calculations are based on fairly standard and simple laytime rules. There is little margin to try and make a ‘profit’ on laytime, especially when demurrage rates are so low, and ports are becoming more efficient in managing line-ups of vessels. Actually now, if you think about it, the commodity charterers often puts forward their laytime calculation before the shipowner submits theirs, simply due to time constraints within the commodity and freight contracts. Time if of the essence, since often, the commodity sale/purchase chain involves multiple buyers/sellers. 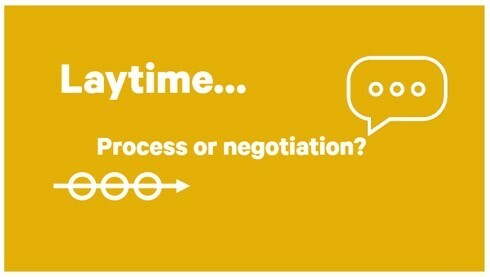 Do you regard Laytime now as more of a process to be managed than a negotiation?